This will be held during our December monthly meeting at our Usual time on the Second Friday of the month, beginning at 8:00pm at the Ritchie Memorial Shelter House. 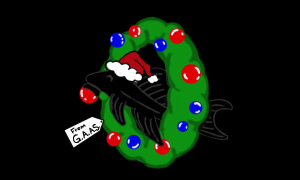 This is another fun event, where instead of having a Speaker or Presentation, the club focuses on providing it’s members and attendees with a wonderful Holiday Dinner as well as Special High Value, Ticket Raffles, and Gift Tables that include a bounty of Club Supplied and Member Donated Fish, Plants, Equipment, etc! Remember, the more club meetings and activities that you’ve participated in throughout the year, the more FREE tickets you will get! So be sure to always sign in at our meetings and events! All BAP and HAP items turned in this month will also be placed among the gift table items. So bring your Favorite Dish, and a Donated Gift, and join us as we spread good cheer! Again remember to bring those coolers, you will need them!